Don't Get Caught With Ugly Towels! No one wants to sit down ready for their haircut by a master of their craft, only to be wrapped up in a shredded, bleached stained towel! Not a good look. Time to freshen up, and replenish your salon towels! 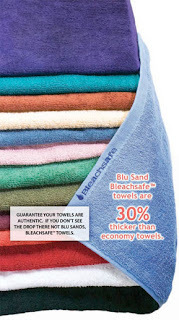 Bleach Proof Towels by Soft 'n Style are resistant to losing color... even with bleach or salon chemicals! Made from the finest ring-spun cotton. They come in a variety of beautiful colors! Check out the full selection here!